We are able to deliver all kinds of bobbins, being manufactured from used tyres. 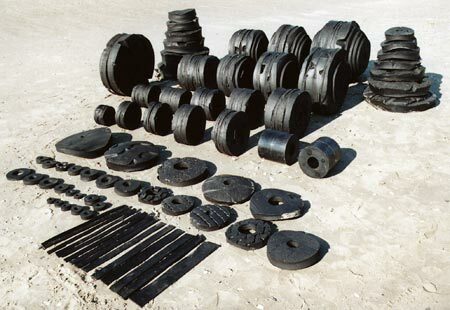 Rubber discs are used for trawl fishing, for mounting on chain or wire in order to protect the trawl from damages. The rubber is an extra sinkline. It is mounted under the trawl to minimize wear and tear to the trawl and furthermore it improves the contact to the sea ground. If the ground is very rough the trawl can be further protected by the so called “rockhoppers”. de rondelles de caoutchouc faites de pneus usés. Consultez-nous pour avoir une proposition.